It may be somewhat ironic that the U.S. Patent and Trademark Office published in the last week of 2010, a year with a boat load of questionable patent filings and approvals, a patent application from IBM, which automates the management of intellectual property and comes with a “defend” module to formulate a strategy in the case of patent infringement. The right to protect inventions and intellectual property from being copied in a frivolous way is one of the foundations of a rewarding economy, but a loose control and oversight in fact can have the opposite effect and we are witnessing astonishing lawsuits based on IP infringement claims every day. A few days ago, Microsoft co-founder Paul Allen revised his rampage against Google, Apple, Facebook and Yahoo. There is an ongoing trial involving a key Wi-Fi patent. And we are lost in confusion who is suing whom over what in the smartphone arena. The latest entrants are Sony and LG: Sony claims that LG infringes on 7 Sony mobile phone patents. Those with massive IP holdings, whether they are used for products or not, may now hope for an efficient software, or at least procedure, how to organize a patent mess from the beginning to end. 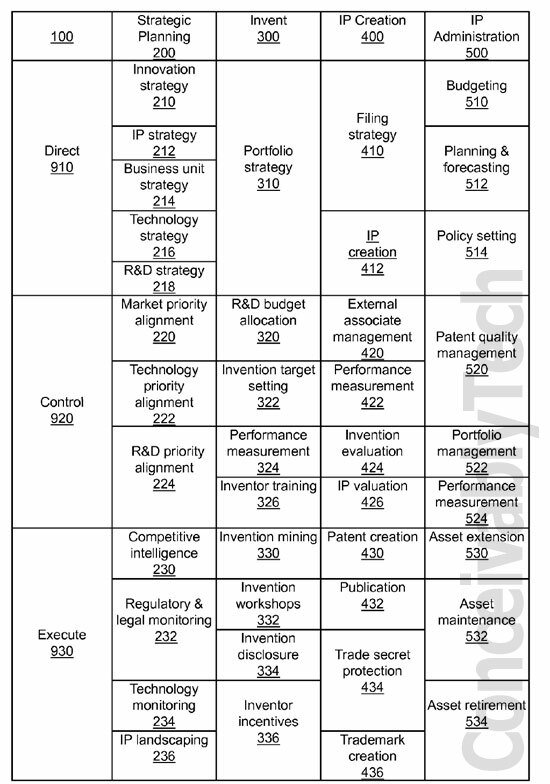 The components are divided in a “direct” portion, which includes the overall strategy such as R&D, portfolio, filing, budgeting and forecasting. “Control” covers factors such as market alignment, invention evaluation, IP valuation, and inventor training. “Execute” includes trade secret protection, trademark creation, IP landscaping, technology monitoring, and competitive intelligence. In case you could not follow the entire phrase, you may want to read the patent filing itself, since IBM found it necessary to repeat these words more than two dozen times. This patent reads a lot like a late Christmas present for Paul Allen (or the entire smartphone industry for the purpose of general entertainment), but there seems to be a deeper meaning in this patent. Some genius at IBM simply collected all the experience IBM gained from filing more than 100 patents virtually every week throughout the year and assembled that into a chart, which was then turned into a patent filing. Essentially, IBM could claim to have patented the …. patent. It covers very broad strategies how to file and protect a patent. So, this particular patent is, in fact, approved by the USPTO, and if you file for a patent in the future, you may want to contact IBM, because you may infringe on at least one ingenious idea IBM laid out in its filing.